I just got put on stimate for my heavy menstrual cycle, i needed to use it twice in a 12 hr time due to heavy bleeding, Is this ok or when I go back to my hematologist in 6 months is their a stronger spray? or more options? It's important that you bring any concerns or questions about your treatment to your hematologist, who is in the best position to answer questions about your treatment regime. 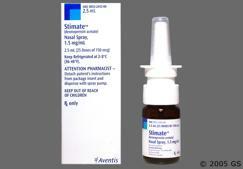 Stimate comes in a concentration of 1.5mg per mL but only 0.1mL is actually sprayed in so the dose is 150mcg. The FDA approved dosing is 2 total sprays (1 per nostril) in patients weighing more than 50kg (so most adults) and 1 total spray in adults and children less than 50kg in patients with mild VWD and mild to moderate hemophilia A. The label does not comment much on frequency of dosing but tachyphylaxis can occur which is when the ability to help you "clot" becomes less rapidly and you begin to have more side effects. The most worrisome is low sodium leading to seizures. Care should be given when used in people with kidney disease and in patients older than 65 and younger than 3-4 years of age. Maximal effect is achieved within 30-90 minutes. Consult your hematologist for more information on your case and spray options. 0 Comments on "I just got put on stimate for my heavy menstrual cycle, i needed to use it twice in a 12 hr time due to heavy bleeding, Is this ok or when I go back to my hematologist in 6 months is their a stronger spray? or more options? " i am a single mom 36 who was just diagnosed with borderline type 1 hemophilia disorder. my mother has type 3 von willebrand disease and my sister is also the same as me. I hope to find out so much info as i can and hope meet some amazing people along the way about this bleeding disorder. I am known online at LoVeMeNoT82 on youtube and fb also twitter.